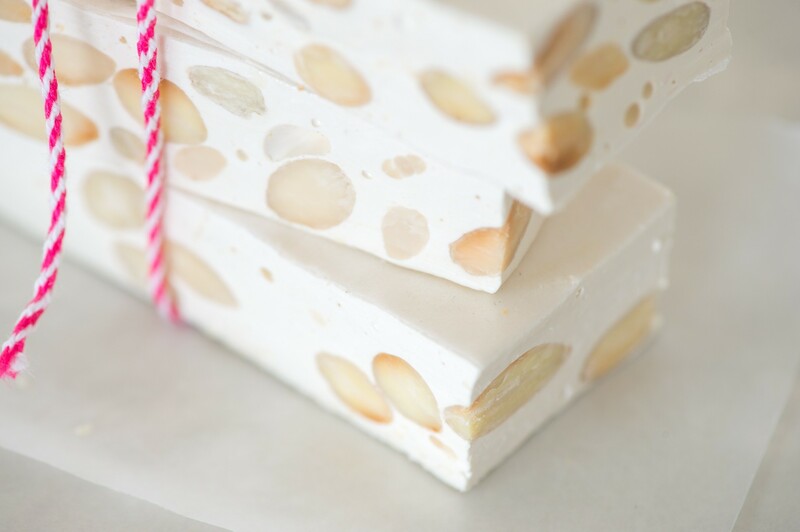 If you love sinking your teeth into sweet, nutty nougat, this Honey and Almond Nougat recipe is just for you! It has a deliciously chewy texture and honey almond flavour. You can of course add any nuts you like, and even dried fruit like cranberries, apricots or glacé cherries. Just keep your total weight of add-in’s to 500g. – A stand mixer is essential as the mixture gets very thick and a hand-held mixer is just not strong enough. – Once you stop whisking, the nougat sets very quickly. Work fast! – Your nuts need to be warm when added to the nougat, otherwise they will cool the mixture down and it will set instantly. – If you prefer a harder nougat, heat the syrup to 155°C. – Adding more honey results in a yellowish coloured nougat and doesn’t seem to increase the honey flavour much. However, heating the honey separately from the sugar helps to preserve that delicate honey flavour. – Things are going to get a bit messy! But nothing that hot water can’t easily clean. Fill your dirty saucepan with water and reheat on the stove to dissolve the hardened syrup. Dip a cloth in a very hot water to clean down sticky kitchen counters. Toast the almonds in a dry frying pan, swirling the pan often until just turning golden and starting to smell toasty. Set aside to cool. Grease and line a 20 x 30cm pan with greaseproof paper, leaving the edges long so that it will be easy to remove the nougat later. Cut a piece of rice paper to fit the base of the tin. Lightly grease the greaseproof paper, then lay down the rice paper. Cut a second sheet to fit the tin and set aside. Place the 350g sugar, glucose, salt and water into a saucepan. Heat on low heat until the sugar has dissolved, stirring frequently. Increase the heat to medium. Do not stir now, but brush the sides of the pan with a wet brush to remove any sugar crystals. Heat the honey in a separate saucepan. Continue heating until the honey reaches 115°C. At this point, start to whisk the egg whites in the bowl of a stand mixer. When they reach soft peak stage, add the 50g sugar and whisk until just starting to form stiff peaks. By now the honey should be reaching 120°C. Add the hot honey to the egg whites while the whisk is running on low speed. Try to aim the syrup between the bowl and the whisk and be careful of any splatters. Leave the whisk running while you continue. Continue heating the sugar syrup until 140°C is reached. Again, add to the egg whites while the whisk is running on low. Once all the syrup is added, increase the speed to medium. Add the vanilla and butter. Continue beating for at least 5 minutes, until the mixture is very thick and the sides of the bowl are no longer hot. If the mixture is under-beaten, it will not set. Meanwhile reheat the almonds in the dry frying pan until warm. Stir the warmed almonds into the nougat until combined, then quickly transfer to the prepared pan. The mixture will be very sticky, so once it has all been transfered to the tin, lightly grease a large spoon or your hands and try to spread the mixture evenly. Lay the second piece of rice paper on top and press down. 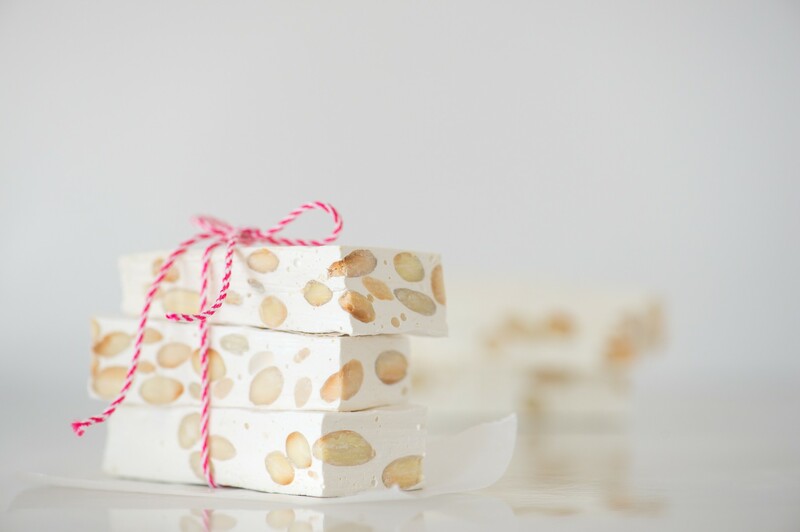 Leave the nougat to set at room temperature, then slice with a sharp, greased knife. 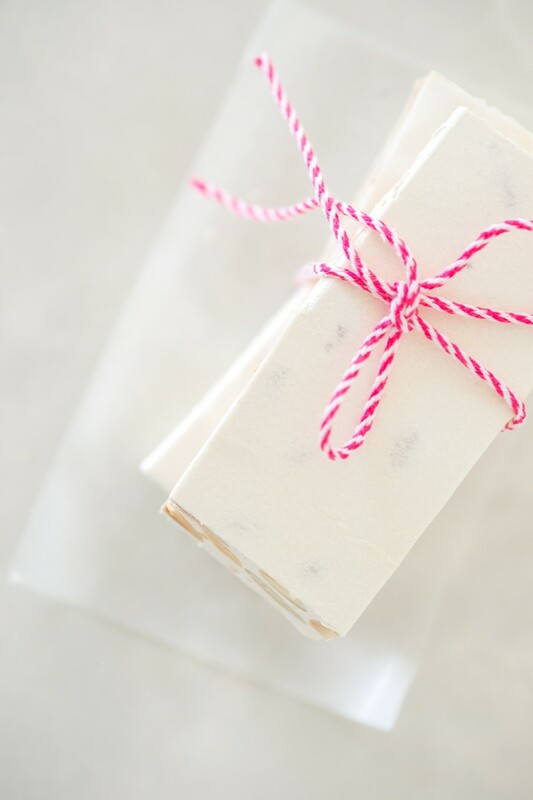 Once sliced, be sure to wrap each piece with wax paper or greaseproof paper as the nougat will start to soften and spread if not wrapped. 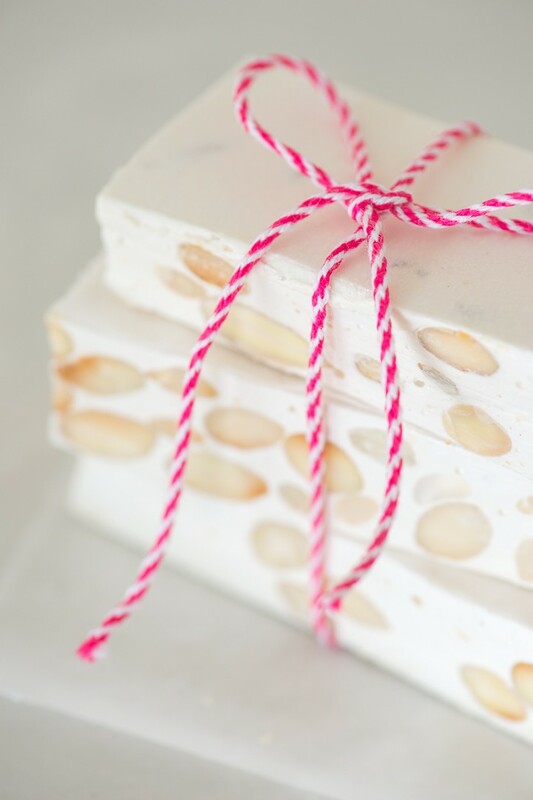 Store the wrapped nougat in a single layer in an airtight container at room temperature. * Liquid glucose and rice paper are available at baking stores. If you can’t find rice paper, spray your lined tin generously with cooking spray to prevent sticking. The recipe calls for glucose: glucose syrup or glucose powder. If syrup, where can it be bought? Hi Micky. Apologies, it is Liquid Glucose, which can be bought at baking stores. Good article. What does the butter do? Can it be excluded in this recipe? Hi Julie! Yes you can leave the butter out. I just found it made the nougat easier to slice somehow. Would love your feedback!